WAKEFIELD, Mass. - Boston University's Corinne Schroeder (Elm Creek, Man.) collects her first WHCA national goaltender of the month recognition for her outstanding finish to 2018. The sophomore netminder finished December with a 3-0-1 record, a 1.02 goals against average and a .964 save percentage, tops among all Hockey East goaltenders who started at least two games during the month. The 5-foot, 11-inch backstop made 37 saves in an impressive 4-2 win over then-No. 4 Boston College to begin the month, and followed that performance by not allowing an even-strength goal in her final three starts of December. 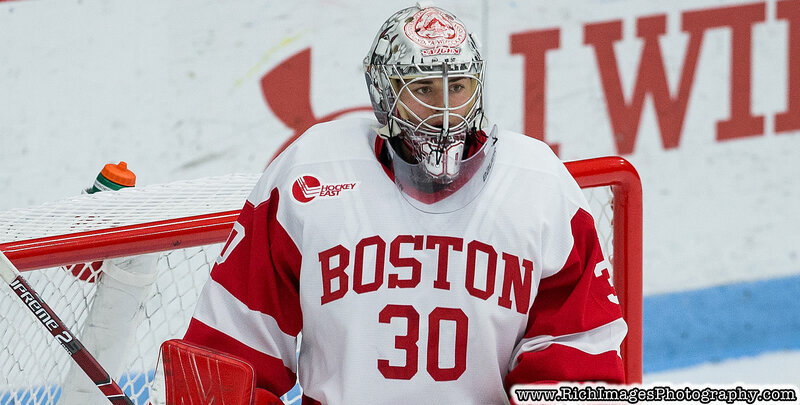 Of all Division I goalies who made at least two starts in the last month of 2018, Schroeder had the best save percentage (.964) and stopped all 22 shots she faced on December 8 at RIT before being relieved after 50:36 of work in an eventual 8-0 victory for the Terriers. Robert Morris' Jaycee Gebhard (Plenty, Sask.) has been named the Women's Hockey Commissioners Association Player of the Month after enjoying a goal-filled December for the Colonials. She totaled four goals in just three games played, tying for second in the country in goals scored and leading the nation in goals per game (1.33). Her first game of the month, a win against College Hockey America rival Penn State, featured the junior's second career hat trick, the first coming back in November 2016. The next week, at then-No. 2 Minnesota, she extended her goal streak to three games with Robert Morris' only tally. Overall, she finished the month with four goals on nine shots and a plus-three on-ice rating. Princeton's Sarah Fillier (Georgetown, Ont.) has been named WHCA Rookie of the Month after building upon her outstanding rookie campaign with eight points during the month of December. The forward led the nation in rookie scoring during the month, netting six goals and dishing out a pair of assists to help the Tigers go 4-0-1, extending their current undefeated streak to 16 games. She scored in four of the team's five contests, including three multi-point performances. Her best two outings came at the beginning and end of the month, as she scored a pair of goals on December 1 to help Princeton beat Quinnipiac 4-1, and closed out the month with a three-point (2g, 1a) game against Merrimack on December 31. Fillier logged a plus-eight on-ice rating in the five game span, and is now tied for the league lead amongst freshman in that category.